Welcome to St. Augustine Parish Community! We are delighted to have you join our parish family. At St. Augustine Parish we know that we are all individual parts of the mystical Body of Christ. Working together, we find great joy in doing God’s work here on earth. 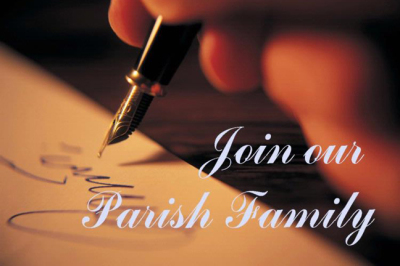 Our parish is proud to offer many opportunities for parishioners to come together in faith. Worship and service go hand in hand but we also need education so we may continue to grow and develop. We pray that you may find warmth and happiness in our parish and that your presence here will be long. God bless you and your family! Please click here to fill out a registration form and send back to: frontdesk@saintaugustinecc.org. Registration forms are available in the Church's Narthex, at the table on Welcome Weekends and in the Parish Office. Please note our parish registrations are to be used only by our parish and our diocese. In no way do we share information you gave us with the government or any outside organization.